Project log books are used to record your daily activity from the very first thing you do in starting the project (an introduction statement what your project is all about), to the completion of the effort (including the final results, did your project meets the core objectives, etc.) Most science project participants use the “Scientific Method” to conduct their project activity and to record the results into a “Log Book” or journal. The Log Book will help you organize your thoughts and procedures. 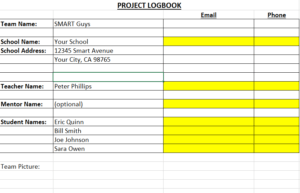 Log books will be submitted with the project at completion, and will be graded along with the project. The first step will be to create a log book or journal. It is the written record showing all your work from start to finish. Take pictures during each step of the process, including appropriate screen shots, and import into the log book. As data is gathered, record results via charts, graphs, etc. Record all appropriate footnotes and source documents used. All work must be that of the student only (work done by any outside sources is unacceptable). The information can be hand written or typed (the student’s choice); however, since this project will be judged in a virtual environment, be sure the data is clear, concise and legible and can be scanned into the document. Submission can be as a doc, pdf, or jpeg. See below for 3 websites discussing Log Book preparation. If additional information is required, please contact Mike Andrews.